What Is a Murder Mystery Dinner? Poison Ratenstein is in town for a killer concert, but his fans may be looking for a refund after this twisted tour turns tragic with a murder and a mystery to solve. This radical show could be super lame if no one can solve who was buggin' so we can all cool out and get the show started! Help the crowd and the detective figure out who ruined this totally tubular night, so everyone can, like, take a chill pill. Make sure you are dressed with the times or someone may ask you to bag your head! 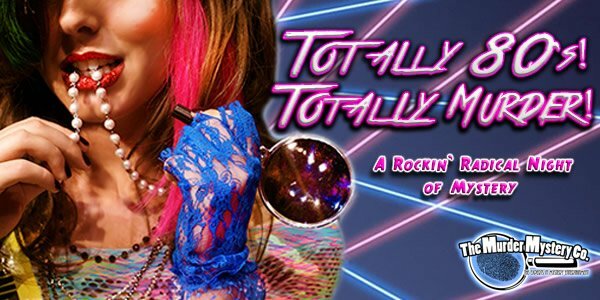 Grab your most righteous '80s concert gear to rock out in style while you solve a crime with your friends. Jean jackets and spandex leggings, big hair, bangles, leg warmers, and ripped jeans will be all the rage at this rocking night of mystery. See you there! Upgrade to VIP Admission and receive a complimentary Mugshot Memento + VIP Seating at the show! A $30 value for just $19 per ticket. This venue is wheelchair accessible. Guests may enjoy free parking on site. If you have a food allergy please call us at (888) 643-2583. Drinks and gratuity are not included in the price of admission. Alcoholic beverages are available for purchase during the show. Find murder mystery dinner shows happening at a location near you. Don't forget to make your meal selections and print your tickets! Host a Murder Mystery Party! Leave us a few clues about your upcoming event. Our mystery party planning experts will be right back in touch!